Chuck is Managing Partner at Northwestern Mutual, and Marcy is a member of the United Way of Metropolitan Nashville Board of Trustees. Creating opportunities to spread the United Way message of help to our Northwestern Mutual family. Serving meals at Safe Haven Family Shelter. Saving our change during the year with our children to donate to the annual United Way campaign. 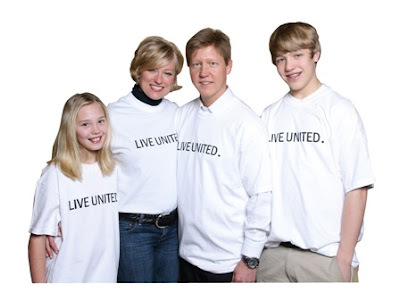 Leave a comment telling us how you LIVE UNITED, and we'll send you a LIVE UNITED T-shirt ... and you'll have a chance to be selected to appear in one of our future LIVE UNITED communications! Learn more about what it means to LIVE UNITED. The words that stand out in my mind when I think "united" is togetherness and oneness. My life is centered around Spiritual Relationship, Family, Career and Community. Spiritual Strength--In order to help others, one must be able to focus on himself / herself. Having a high level of inner strength helps me to do so. Family-- This is the core of human development. The family structure must be strong and supportative in order to help create a well rounded outlook on life. Career-- The organization that I am associated with is all about becoming "United." UPS, once known as "United" Parcel Service, is focused on consistancy and uniformaity throughout the organization. UPS promotes community awareness and maintains "acts of kindness" on a global scale. The core of our business is to provide the physial service and the human service. Community- Volunteerism helps to increase awareness and offers much needed support to groups that focus on changing lives. Making a difference in the life of one that may be less fortunate financially or physically or mentally challenged can be very rewarding. The Ochoa Family - Bob, Gina & Kayla. We love to participate at Loves and Fishes - preparing and serving meals for the homeless, we help with Habitat projects through our church St Stephen Catholic Community. We also give our time to our church in other voulunteer projects because we are blessed to have health, food on our table and home to live in. We believe in giving back to our community because we receive so much in return when we do.